Order within 10 minutes for Same Day Delivery! 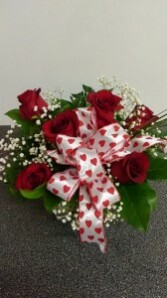 Six premium "Freedom" red roses in a clear glass cube. 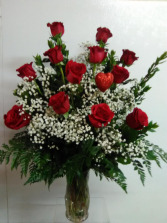 Perfect for the work place or office. 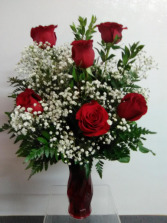 SIX LONG STEM PREMIUM RED ROSES IN A RED VASE WITH WHITE BABY'S BREATH AND GREENS.